Emeralds member Mark McGuire presents his heart-melting solo album for Editions Mego. Mark is no stranger to solo releases, he's got about 800 gazillion of them on tiny tape and CDr labels including his co-run Wagon Tapes and Gneiss Things besides a tonne others. He's also worked with Daniel "Oneohtrix" Lopatin as Skyramps, but for all we've heard ' 'Living With Yourself' is surely his most accomplished excursion yet. 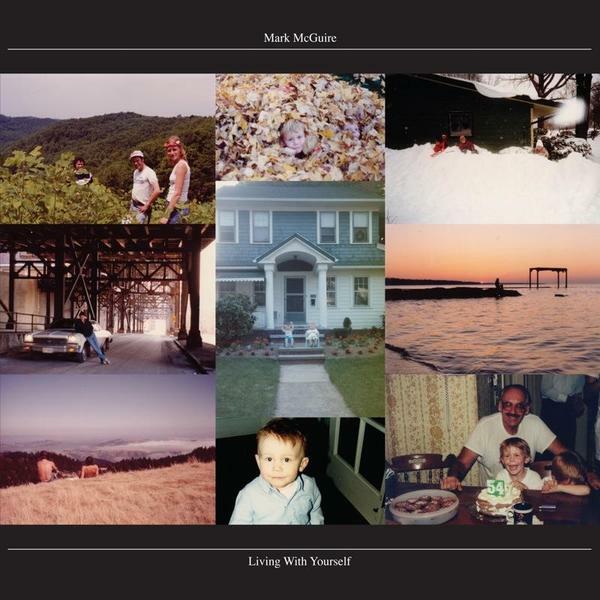 Taking inspiration from early friendships, family and "the problems that inevitably develop through years of knowing someone" McGuire's compositions tenderly unfurl nostalgic scapes of Göttsching-like guitar forms and bubbling synths with that endless ability to capture elusive, fleeting moments of bliss like the best of his work with Emeralds. His knack for blending acoustic guitar signatures with magical synths is conducted with the keenest sleight of hand, not deceptively so, but more like an illusion of blissed misdirection, contrasting and melding textures and harmonic qualities to create unpredictable crux points that'll leave you beaming inside. He dispenses this formula to sublime effect on tracks like opener 'The Vast Structure Of Recollection' and the achingly affective 'Two Different People', delivering acute hits of romantic yearning and ponderous wonderment with a beautifully instinctive nature. Possibly most gorgeous of all is 'Clear The Cobwebs', paring down the synths for a largely solo guitar delight with a flourish of electrcity in the final throes, and furthest from anything we've heard previously is 'Brothers (For Matt)', a ten minute closer floating from tape collage to Shoegaze thrash with a meditative kosmische finalé. There's an intimate personality and existentialist optimism to 'Living With Yourself' which we reckon will really take hold after a few listens. Highly Recommended.